Hodges, Peter. Royal Navy Warship Camouflage, 1939-1945. Sullivan, Jim. A-3 Skywarrior in Action - Aircraft No. 148. We can help you find the modeling books you are looking for. As the world's largest independent marketplace for new, used and rare books, you always get the best in service and value when you buy from Biblio.com, and all of your purchases are backed by our return guarantee. Leatherhead: Profile Publications. 16 pages 35g. Stapled paper covers FINE. Illustrated with b/w photographs plus 4pp. of colour drawings.. 1st Edition. Paper Covers. Fine. 8vo - over 7¾" - 9¾" tall. Oxford: John Beaufoy Publishing Ltd, 2015. 208 pages, 1.18kg. Pictorial laminated boards Near MINT in a FINE d/w. Illustrated with colour photographs and locations maps, with maps to paste-downs. A portrait in words and photographs of 50 of the most scenic, remote and long-distance routes in Asia, Africa, Australia, North and South America, and Europe.. 1st Edition. Hard Cover. Near MINT/Fine. 4to - over 9¾" - 12" tall. Book. Berkhampstead: Albatros Productions Ltd, 1995. 32 pages, 115g. Stapled soft card covers FINE. Illustrated with d/w photographs and drawings. Colour profile to rear cover. . 1st Edition. Stapled Card Covers. Fine/No Jacket. 4to - over 9¾" - 12" tall. Germany: Modellsport Verlag, 2000. 66 pages, 270g. Soft card covers FINE. Illustrated with colour photographs and scaled line drawings. . 1st Edition. Soft Card Cover. Fine/No Jacket. 4to - over 9¾" - 12" tall. Atglen, Pennsylvania, U.S.A: Schiffer Publishing Ltd (US), 1999. 288 pages, 1.75kg. Cream cloth boards Near MINT in a Near MINT d/w. Illustrated with b/w photographs. Owing to the weight, extra shipping overseas will be required.. 1st Edition. Hard Cover. Near MINT/Near MINT. 4to - over 9¾" - 12" tall. Book. London: Percival Marshall & Co Ltd. G: in good condition without dust jacket as issued. 1935. First Edition. Paperback. 230mm x 160mm (9" x 6"). 36pp + ads. .
Shepperton: Ian Allan, 1966. 192 pages, 505g. Blue cloth boards FINE in a Near FINE d/w. Illustrated with b/w photographs. Volume 3 of the series, Hardback.. 1st Edition. Soft Card Cover. Fine/Near Fine. 8vo - over 7¾" - 9¾" tall. Book. Poland: Stratus, 2002. 96 pages. 275g. Soft card covers MINT. Illustrated with colour and b/w photographs and colour drawings. Includes a full list of GC 1/145 Aircraft including colour profiles. Ideal for modeller and historian.. 1st Edition. Soft Card Cover. As New/No Jacket. 8vo - over 7¾" - 9¾" tall. Oxford: Oxford Publishing Co., 1971. 138 pages, 645g. Oblong format Gray cloth boards Near FINE in a POOR repaired and worn d/w in clear removable wrap. Fully illustrated with b/w photographs and scaled line drawings for the railway modeller.. 1st Edition. Hard Cover. Near FINE/Poor. 8vo - over 7¾" - 9¾" tall. Bruxelles: Paul Legrain, 1981. 160 pages, 1.14kg. Green cloth boards FINE in a Very Good d/w rubbed to corners and top of spine. Illustrated with b/w photographs. . 1st Edition. Hard Cover. Fine/Very Good. 4to - over 9¾" - 12" tall. Book. Berkhamsted: Albatros, 1996. 32 pp, 11 5/8" H. B&w and colour photographs, drawings, plans. Contents: Propwash - readers write; Logbook - New WW1 books and journals; Archive - AEG J.I - Photos from Colin Owers; The Maquette Kit of the I'lya Muromet in 1:72 Scale: A personal viewpoint by Harry Woodman; Albatros News - three new MINI-DATAFILES! 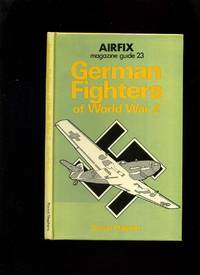 ; Revell's Fokker D.VII - kit review; Scale Modelling in WW1 - No.3; Caproni Ca.20 Fighter Monoplane - story by Gregory Alegi (GAVS); Products - new kits, accessories and transfers; Gallery - reader's models in colour. Interior - clean and tight with no previous ownership marks. Exterior - very light wear at top/bottom of spine, very small bump at bottom edge of book, tiny tear at bottom edge of rear cover, small old price sticker on fron cover.. Stapled in Wraps. Very Good -. Bracknell: Forge Books, 1986. 32 pages, 130g. Stapled soft card covers FINE. Illustrated with b/w photographs, maps and drawings. . 1st Edition. Stapled Card Covers. Fine. 4to - over 9¾" - 12" tall. Book. Cambridge: Patrick Stephens, 1983. 219pp. 540g. Green cloth boards. FINE a Near FINE price-clipped d/w. Illustrated with b/w photographs and line drawings. Aimed primarily at the beginner, but contains much useful information for anyone active in this hobby.. 5th Edition Reprint. Hard Cover. MINT/Near MINT. 8vo - over 7¾" - 9¾" tall. London: Percival Marshall & Co Ltd. G: in good condition without dust jacket as issued. 1938. First Edition. Paperback. 230mm x 160mm (9" x 6"). 36pp + ads. .
Hersham: Oxford Publishing, 2004. 160 pages, 885g. Black cloth boards MINT in a FINE d/w with very slightly sunned spine. Fully illustrated with b/w photographs and scaled line drawings. The Third Volume of the series. . Reprint. Hard Cover. As New/Near MINT. 4to - over 9¾" - 12" tall. Book. Ships and Ships Models Volume VII - Jan to Dec 1938 Publishers Binding. London: Ships and Ship Models Magazine, 1938. 360 pages, 810g. Publishers blue cloth boards with gilt lettering rubbed to extremities, and a 'Tea Cup Ring' to front cover, Very Good with the contents tight and clean. Illustrated with b/w photographs, drawings and fold-outs. . 1st Thus. Hard Cover. Very Good. 8vo - over 7¾" - 9¾" tall. Book. Shepperton: Ian Allan Limited, 1983. 160 pages. 480g. Black cloth boards Near MINT in a Near MINT d/w. Illustrated with b/w photographs and scaled line drawings. An account of Sir Nigel Gresley's contribution to the development of the steam locomotive.. 1st Edition. Hard Cover. Near MINT/Near MINT. 8vo - over 7¾" - 9¾" tall. Book. Truro: D. Bradford Barton, 1983. 31 pages, 155g. stapled soft card covers FINE. Illustrated with scaled line drawings for the railway modeller.. 1st Edition. Stapled Card Covers. Fine/No Jacket. 8vo - over 7¾" - 9¾" tall. London: Bryant & May Ltd. G : in Good condition. Covers rubbed with some edges tears and creasing. . First Edition. Stapled Pamphlet. 240mm x 150mm (9" x 6"). 31pp. With black and white illustrations. .
Shepperton: Oxford Publishing Co., 1999. 192 pages, 1kg. Blue cloth boards Near MINT in a FINE d/w. Illustrated with b/w photographs and maps. . 1st Edition. Hard Cover. Near MINT/Fine. 4to - over 9¾" - 12" tall. Book. London: Percival Marshall & Co Ltd. G: in good condition without dust jacket as issued. 1937. First Edition. Paperback. 230mm x 160mm (9" x 6"). 36pp + ads. .
Paul Gaudette. PAPERBACK. B000K7O61C Moderate rubbing to the cover edges, clean, has a good binding, no marks or notations. . Good. Penryn. : Atlantic Transport Publishers, 1995. 84 pages, 390g. Soft card covers Near MINT. Fully illustrated in colour and b/w.. Reprint. Soft Cover. Near MINT/No Jacket. 4to - over 9¾" - 12" tall.